Our pool service offers maintenance, cleaning, and repairs for your pool, no matter what kind of pool you have. If you live in the Phoenix area and you have a pool, we can offer you our services to keep your pool clean and ready for swimming. We have the proper equipment and knowledge to keep your pool in top shape. Our swimming pool service is ideal for anyone who needs a routine cleaning or maintenance to their pool. If you have just recently purchased a new swimming pool, you might contact us to set up a regular cleaning and maintenance schedule. If you are considering purchasing a pool, and you know you don’t have the time for maintenance, we can help you out. Don’t feel afraid to buy a pool because you can’t keep up with the maintenance. If you aren’t satisfied with your current pool company, give us a call. We have lots of very happy customers, and would love to add you to that list. 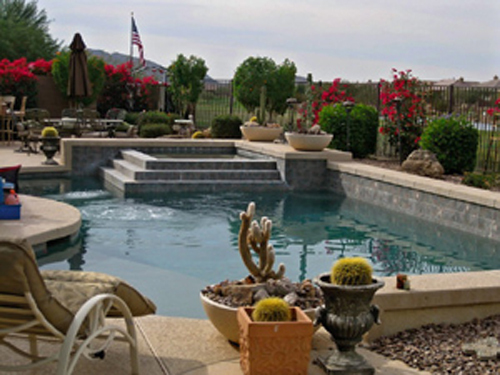 If someone has just purchased a home in the Phoenix area (including Tempe, Gilbert, Scottsdale or any other nearby city), they can feel free to call our pool service for their newly acquired backyard pool. We welcome you to the neighborhood, and we want to welcome you to our pool services as well. 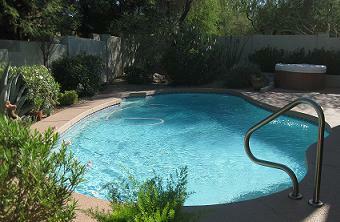 Dan's Pool Catering, the swimming pool cleaning service company in Phoenix. No matter what your reason for checking out our pool company, we want to thank you. We provide our customers top-notch service and quality; we’ll keep the water in your pool safe and chemically balanced so it won’t irritate your body or damage any pool equipment. Balancing your pool chemically can also help the water from becoming infected with algae or from becoming cloudy. Different companies provide different levels of pool services to their clients. We do pool maintenance and cleaning, including making sure the chemical makeup of your pool is balanced, that algae isn’t forming on the sides of the pool, and that no debris is collecting. We also do pool repairs. If you have minor cracks or parts that need replaced, we can help you make the necessary repairs to make you pool usable again. If you’re thinking about purchasing a pool for the first time, there are a few different options you can choose from. You can choose a swimming pool made with fiberglass, cement, or vinyl. Each of these materials has different benefits and drawbacks. If you’re looking to buy a pool or you’ve recently purchased one, we can be your pool service company. Give us a call and we will be happy to solve any problems for you. People choose to use our swimming pool service for a number of reasons. 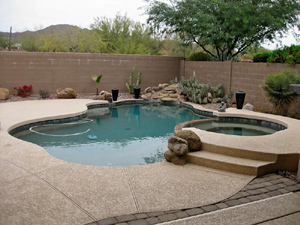 Whether they’re new at pools or are changing services, we are glad to accept any new customers anywhere around Phoenix, Arizona as well as Glendale, Scottsdale, Peoria, Tempe, Gilbert, Mesa, Paradise Valley, Fountain Hills, Cave Creek, Carefree and the surrounding areas. We rely on our customer’s satisfaction and they rely on our professionalism and knowledge about pools. Maintaining your own pool takes an awfully long amount of time for beginners, and to have a sufficient amount of cleaning equipment can be expensive. Let our company take care of all your pool needs. You just sit back and relax and enjoy a clean, fresh pool. Please see our menu of weekly services on the Monthly and Weekly Service Rates page. 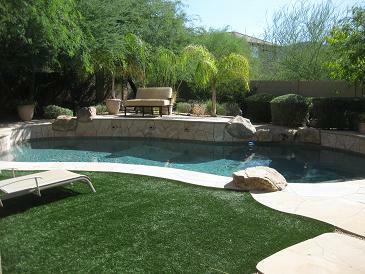 We provide pool service in Phoenix, Arizona as well as Glendale, Scottsdale, Peoria, Tempe, Gilbert, Mesa, Paradise Valley, Fountain Hills, Cave Creek, Carefree and the surrounding areas.